Show your pride as an American business owner with these classic laser checks featuring a waving US Flag. It's the perfect combination of professionalism and patriotism. 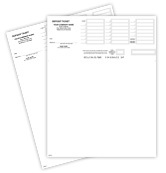 QuickBooks and Quicken Top Checks are our most popular business check. Now you can get yours with some star-spangled style. 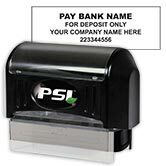 The convenient voucher check makes this an excellent choice for both payroll and general disbursement. There's space for two vouchers underneath a check positioned at the top of the sheet. If you need standard lines or two signature lines printed on your laser checks, make sure to select the appropriate checkbox next to the product image. You can also have this product reverse collated. 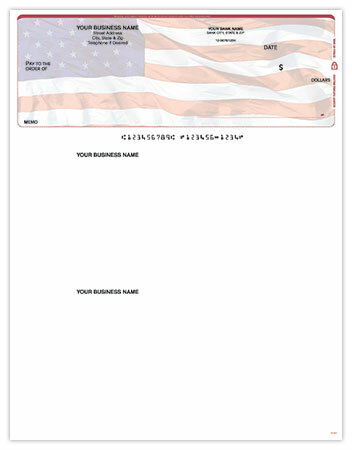 Choose this attractive premium laser check design to proudly display your love and loyalty for the USA!